Our 30th Anniversary year was another success in so many ways, most importantly, nearly 2,000 children explored their favorite topics and discovered new interests in 110 classes and camps! 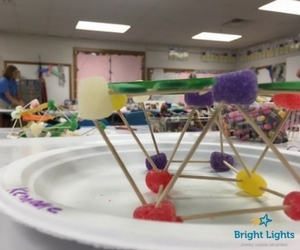 For 30 years, Bright Lights has evolved to provide the kinds of Summer Learning Adventures children want, and 2016 was no exception. The three fastest-filling classes were all new: LEGO Jr. Simple Machines, Building Beyond Blocks and Cupcake Decorating Wars. Other longtime favorites were updated with new activities and class names. Partnerships with the Nebraska Game and Parks Outdoor Education Center and the University of Nebraska-Lincoln created more exciting opportunities. A first in year 30—Holmes Elementary School served as the main classroom site. Principal Haeven Pederson, teachers and support staff all provided a warm welcome and made Bright Lights feel right at home. Bright Lights staff and summer administrators worked tirelessly to develop and implement safety procedures and keep the program running smoothly all summer long. We also should mention that nearly 60 students from Japan participated in Bright Lights at Lux Middle School. This was the 15th year for the International Program in partnership with our friends from Japan.